Last week, the same friend who shared her pickles also shared a BIG box full of cucumbers from the wealth of her garden. From that, I started my first attempt at making Mowmow’s sweet pickles on my own. Step one: pack whole cucumbers in gallon jars. I didn’t have a gallon jar, but I remembered Mitch’s large glass jar we fill with change. Joseph helped me empty it into a smaller jar, not a difficult task as it wasn’t near full. Money is so dirty; think of all the hands that touch it. We had actually cleaned all we had a few months ago before counting it for a schoolwork task after inspired by a friend’s blog. But still, the idea of all of the germs in that jar, ugh. So it got scalded and scrubbed and then scrubbed some more, then filled with cucumbers. When Mitch saw it later, filled with cucumbers in their salt water soak, he reminded me that he got that big jar from my Pappow! Wash cucumbers and slice into the size pieces you like. Soak overnight in 4 Tbsp. alum and enough water to cover. Wash and drain. Make syrup of 2 quarts sugar, 1 quart white vinegar, 12 whole cloves, and 2 sticks cinnamon. Bring cucumbers and syrup to boil and let stand 2 days and nights. 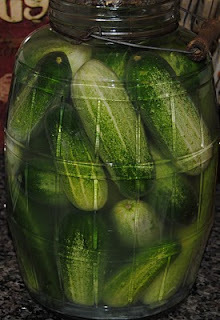 Pack cucumbers in jars. 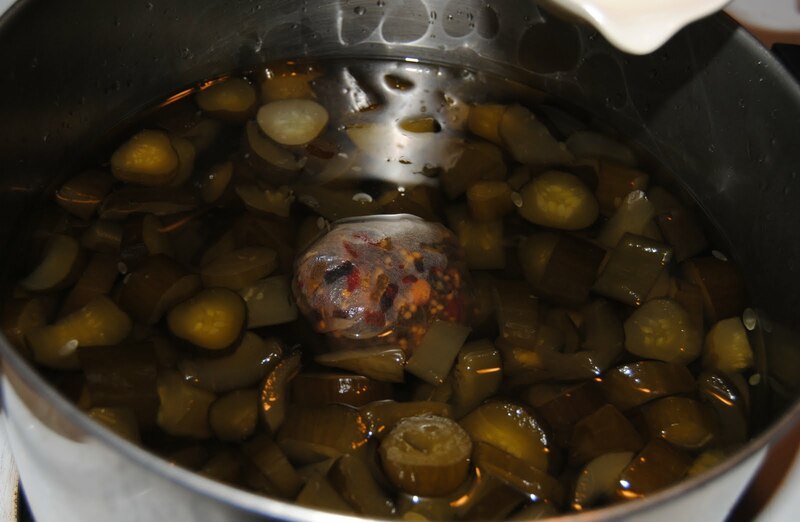 Bring syrup to boil and pour over cucumbers and seal. Mowmow recommended we let them sit for at least 3 weeks before opening a jar, to fully develop the taste.